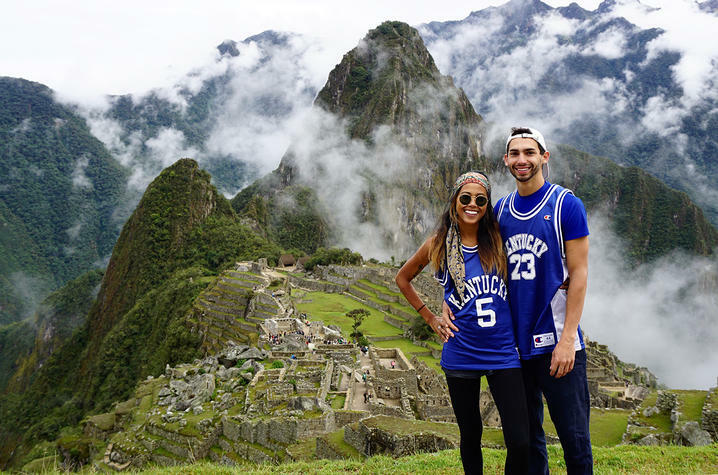 Melanie Pynappel, an integrated strategic communication alumna, and Andrew LaFever, marketing alumus, at Machu Picchu in Peru. LEXINGTON, Ky. (Sept. 10, 2018) — Education Abroad & Exchanges (EA) at the University of Kentucky will host its Fall Fair from 3-6 p.m. Tuesday, Sept. 18, in the Gatton Student Center Grand Ballroom. The Fall Fair is EA’s biggest event of the year. At the kick-off, students will have the opportunity to learn about EA offerings, speak with program and department representatives and determine which type of program is the best fit for their major and interests. In addition, students can learn more about resources available to them, including the Office of Financial Aid and Scholarships, James W. Stuckert Career Center and Wildcat Passport Acceptance Facility. At the fair, six STA Travel vouchers will be raffled off — one $1,500 voucher and five $100 vouchers. Students will automatically be entered into the raffle at the event check-in by swiping their UK ID card. Giveaways at the fair will include T-shirts and Auntie Anne’s pretzels while supplies last. International Studies Abroad (ISA): ISA offers scholarships of different amounts to students on their programs. UK students are also eligible to apply for the UKEA and ISA Diversity Scholarship, an award up to $5,000. CEA: CEA offers scholarships from $300-$3,000. The UK EA scholarship deadline for spring programs is Oct. 1. To find out more about additional scholarship opportunities before the fair, visit the EA website. Education Abroad has more than 460 programs available in more than 70 countries. In addition to study abroad opportunities, students can participate in internship, service, research and teaching programs abroad. Students interested in learning more about education abroad opportunities can go online or visit the Advising Center at 315 Bradley Hall. For more information on how to #SeeBlueAbroad, stay up to date with UK EA events, deadlines and more on Facebook, Twitter and Instagram.